MADISON – The University of Wisconsin System contributes $24 billion to the state’s economy each year, which is a 23-fold return on Wisconsin’s investment in the university, according to a new study. The 2018 UW System Economic Impact Study by NorthStar Analytics refreshes a 2002 economic impact report prepared for the UW System by the firm then known as NorthStar Economics. The new study shows the UW System’s economic impact measures have more than doubled in the years since. Ward will present the report to the Board of Regents at its next meeting on Aug. 23 in Madison. The overwhelming beneficiary of UW System’s economic impact is the state’s private sector, receiving 75 percent – or $18 billion – of the economic benefit annually. Spending associated with campus operations, UW Hospitals and Clinics, startups, students and visitors, and affiliated organizations benefit a wide range of private sector businesses. Each year, the UW System confers more than 36,000 degrees, and a very high percentage of recent graduates (more than 80 percent) stay and work in Wisconsin. “This continuing stream of new college graduates helps to replenish the talent base of Wisconsin’s workforce and provides skilled employees for Wisconsin businesses,” Cross said. Additional data show that UW System graduates with bachelor’s degrees are filling key shortages in health care, science, and engineering fields. In 2016-17, there were 9,716 science, technology, engineering and math (STEM) graduates, and 3,460 health-care graduates. According to NorthStar, the updated study reflects a conservative view of the UW System’s overall impact, since it does not take into account some of the additional benefits the university provides to the state, including the cumulative effect of typically higher salaries of college graduates over time and the secondary impacts of sponsored research, entrepreneurship and innovation that naturally arise from university exploration and experimentation. The NorthStar document points out that the economic impacts of these additional benefits, while not included within the scope of the study, likely far outweigh those reported. The UW System is a major source of research and innovation. More than $1 billion of sponsored research activity occurs on UW System campuses each year. The output of much of this research benefits citizens and businesses in Wisconsin, as well as across the nation. Each year, the Wisconsin Alumni Research Foundation (WARF), the Milwaukee Research Foundation and the WiSys Technology Foundation collectively generate hundreds of disclosures and patents, provide support for numerous innovations and licensing agreements and incubate and guide startups and spinoffs created by faculty, staff and students who are increasingly focused on shortening the pathways from idea to product commercialization. “The UW System is becoming an increasingly energized and growing innovation ecosystem, with a new patent filed every 49 hours on average,” Cross said. In addition to state support of the UW System mentioned in the study, the federal government is a primary source of student financial aid, encompassing approximately 70 percent of the more than $1.3 billion in aid provided to UW System students every year. Federal financial aid helps keep college accessible and affordable for tens of thousands of students each year. 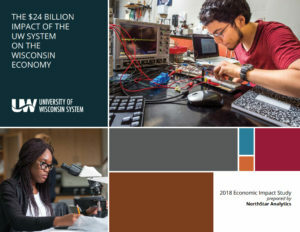 View the electronic version of the 2018 UW System Economic Impact Study by NorthStar Analytics. For hard copies of the report, contact UW System University Relations.